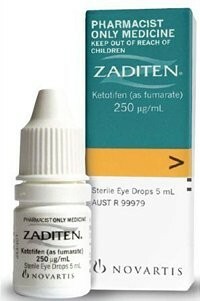 Product Use : Zaditen is a triple action anti allergy eye drop. Zaditen is a triple action anti allergy eye drop stopping the allergy circle at three different points. It is recommended for short term treatment of symptoms of seasonal allergic conjunctivitis (itchy, watery red or swollen eyes and/or eyelids). Because of it's high activity Zaditen is highly effective in relieving itchiness within minutes and it lasts up to 12 hours. It can be used in adults and children 3 years and older. Adults, elderly and children( age 3 and older): One drop of Zaditen into the eyes twice daily. Zaditen eye drops contain benzalkonium chloride therefore they should not be instilled while you are wearing lenses. Your lenses should be removed before application of the drops and not reinserted earlier than 15 minutes after use. Don't miss out - sign up here for exclusive special offers.